This morning or late last night, Motorola released a new version of their device software update timeline website. In the past, the page was nothing more than a giant table filled with devices and scheduled rollout times for updates, but this new version allows you to sort it by country, carrier and then device. Once a device has been selected, it will tell you the last update that was received or if there is a new one coming in the near future. You will also find a link to the support page for the device which tells you whether or not you are on the latest version of software and provides a changelog. Last, you can sign-up to receive emails notifying you of new software updates. The new site isn’t a one page cluster**** as it was in the past, but it does require that you click a couple of extra links to get where you need to go. Overall, it’s a much better design that in the end, offers you more info than you were getting in the past. 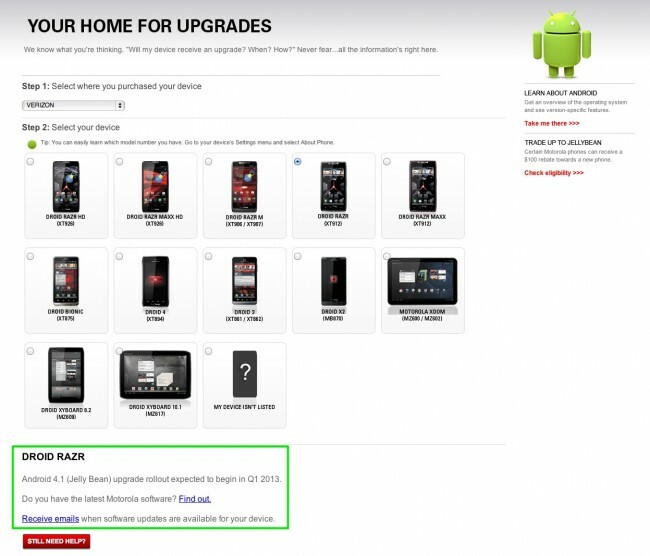 On a related note, the support pages for the original RAZR and RAZR MAXX now say that the “expected” rollout of Jelly Bean should begin in Q1 of 2013. Motorola had previously mentioned this on places like Facebook, however, their official timeline never did reflect this timeframe. The previous versions of the update timeline simply said that both devices would be updated to Jelly Bean, but gave no indication as to when. Let’s not forget that Moto accidentally pushed a Jelly Bean build to the original RAZR back on X-mas Eve. That was clearly an early test build, but one that seemed fairly stable for the most part. I don’t know what’s holding them back from finally pushing it out, but we all know how the software update game works when carriers are involved. Q1 does have another month in it, so try to stay patient. Also of note, the Motorola PC software was updated this morning. While I rarely use it and am not incredibly versed in its feature-set, there is an option listed as “Check for device update.” I’ll leave those of you who have used the software more than I to confirm whether or not this is new. If so, this could essentially be another way for Motorola to get updates to your devices. I’d assume they’ll still need carrier approval, but this could help you skip the waiting line for OTA updates.